Portions of this essay were originally delivered in “Poverty, Power, and Place in Metropolitan Atlanta,” Atlanta Studies Symposium keynote address, 4 April 2014, Atlanta, Georgia. Many neighborhoods in central Atlanta had poverty rates higher than the city’s average of 20 percent. 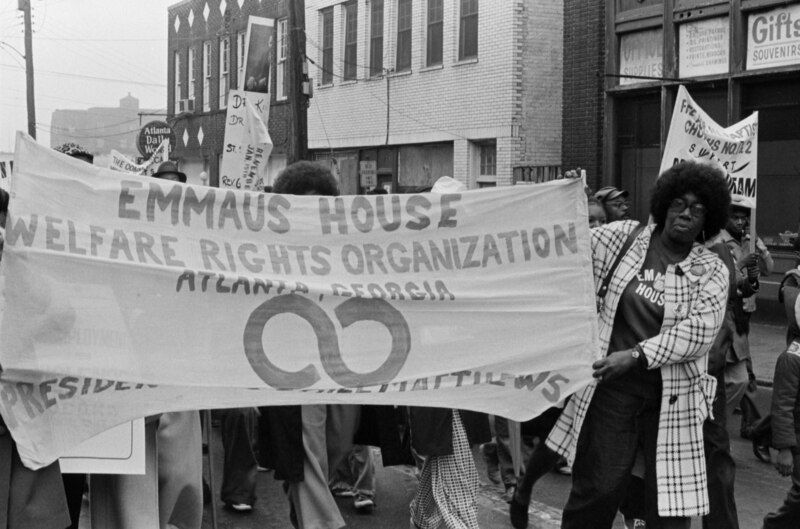 Emmaus House was established in two vacant houses at the corner of Capitol Ave and Haygood in Atlanta’s Peoplestown neighborhood. Cartographic/boundary data is courtesy of the Minnesota Population Center. National Historical Geographic Information System: Version 2.0. Minneapolis, MN: University of Minnesota, 2011. Census data is courtesy of Terry K. Adams, Census of Population and Housing, 1970, extract data [Computer file]. 2nd release. Ann Arbor, MI: Economic Behavior Program, Survey Research Center [producer], 1991. Ann Arbor, MI: Inter-university Consortium for Political and Social Research [distributor], 1992. Map produced by Matthew L. Mitchelson, Kennesaw State University. Father Austin Ford (center), launched Emmaus House for the Episcopal Diocese of Atlanta in 1967. Here Ford and women of the Emmaus House chapter of the National Welfare Rights Organization wait to meet with the Atlanta mayor. Circa mid-1970s. ©Boyd Lewis. Image Courtesy of the Kenan Research Center at the Atlanta History Center. 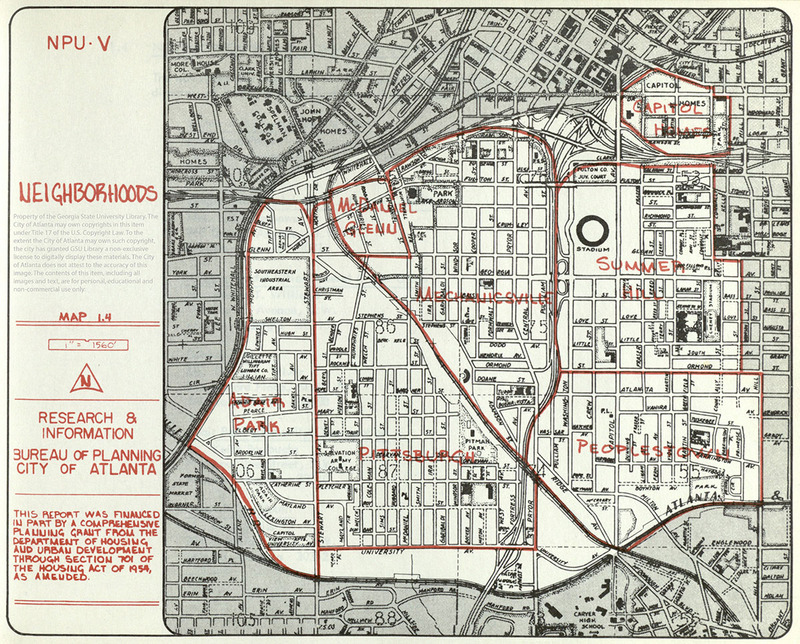 Map of Atlanta Neighborhood Planning Unit V, 1976. Planning Atlanta City Maps Collection, Georgia State University Library. Courtesy of Georgia State University. 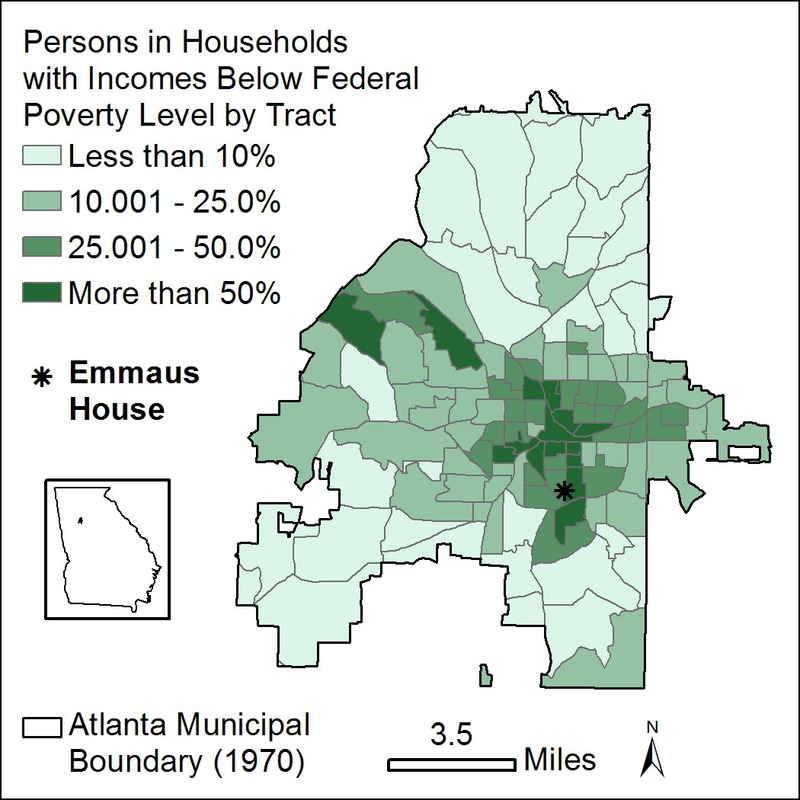 Importantly, the three groups—Emmaus House, Atlanta NWRO, and GPRO—focused on different but related aspects of the anti-poverty cause. GPRO—with its connections to lawyers and policy specialists—provided technical expertise, lobbying, and specific policy proposals. The women of the Atlanta NWRO brought authentic experiences and utilized direct action—persistently, loudly, and forcefully. Emmaus House provided office space, meeting space, labor, leadership, a sustained and reliable base from which to operate, and (through its own local and national network) technical expertise. In coalition, the organizations attacked the conditions and structures of poverty through a variety of means. 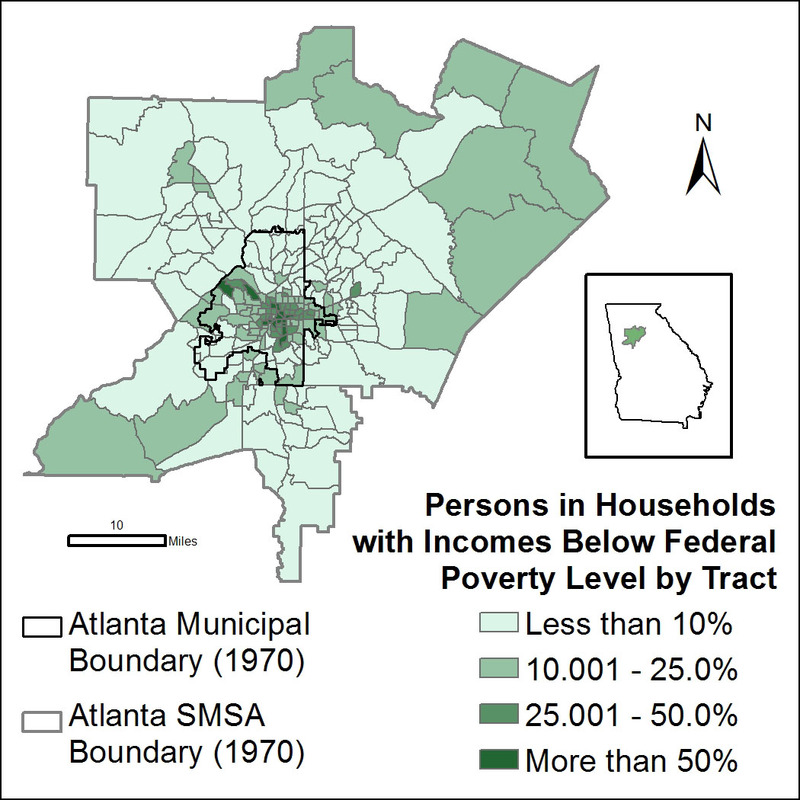 Organizing among the poor was a challenge in Atlanta, as elsewhere. Work and family obligations prevented full participation of the poor in building a movement. Tenant movements tended to peter out once demands were met. And the assumption that poverty was a temporary condition kept many from collectively organizing. In this period, lack of electricity and phones among the city’s poorest residents hampered information exchange, and access to transportation was an on-going challenge. Moreover, railways and expressways cut through sections of central Atlanta, creating physical hazards and barriers for those attempting to traverse the city. And new public housing relocated poor families to the city’s perimeter, creating a challenging geography across which to organize. 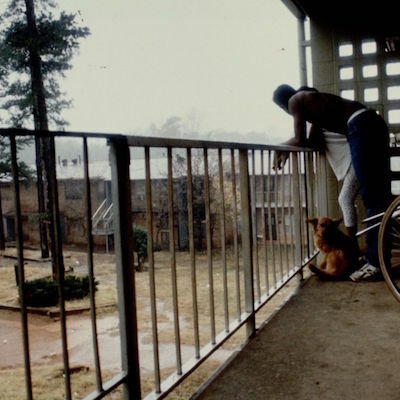 Despite these obstacles, Emmaus House staff and volunteers devised an infrastructure that moved beyond connecting poor residents to resources; they enhanced residents’ understanding of and abilities to engage with bureaucratic infrastructure that affected their entitlements and lives. Through the Poor People’s Newspaper, the Emmaus House news, pamphlets, and meetings, Emmaus House broadcast “how to’s,” distilled and translated complex laws into plain language, and coached residents on how to secure services and manage local bureaucracies. Staff and volunteers proactively fostered local organizing by hosting movement leaders (such as national leaders of the NWRO) and disseminating success stories and tools. To be sure, the anti-poverty movements birthed and supported by Emmaus House weren’t the first in the city. But Emmaus House contributed methods by which individuals could challenge entrenched structures, persistent staffing, the ability connect and network across space, and the willingness and know-how to incubate groups that brought different organizing approaches to anti-poverty work. In these ways, Emmaus House provided an on-going, sustained foundation for the growth and development of a larger, multi-faceted antipoverty movement. LeeAnn Lands is Associate Professor of History and American Studies at Kennesaw State University and the author of The Culture of Property: Race, Class, and Housing Landscapes in Atlanta, 1880-1950 (University of Georgia Press, 2009). She is completing a book on anti-poverty movements in the urban South. Funding for research on Emmaus House and community organizing in Peoplestown was funded by the KSU College of Humanities and Social Sciences, the Department of History and Philosophy, and the Center for Excellence in Teaching and Learning. 1. ↵ Poor People’s Newspaper, no date, folder 4, box 1, Muriel Lokey Papers, Kenan Research Center, Atlanta History Center (hereafter referred to as the Lokey Papers). 2. ↵ The welfare rights chapter was referred to by different names over time, including the Atlanta National Welfare Rights Organization and the Emmaus National Welfare Rights Organization. 3. ↵ A number of recent historical works have examined the War on Poverty and Equal Opportunity Act as they were instituted in the South. See, in particular, Susan Youngblood Ashmore, Carry It On: The War on Poverty and the Civil Rights Movement in Alabama, 1964–1972 (Athens: University of Georgia Press, 2008); Kent B. Germany, New Orleans after the Promises : Poverty, Citizenship, and the Search for the Great Society (Athens: University of Georgia Press, 2007); Lisa Gayle Hazirjian, “Combating NEED: Urban Conflict and the Transformations of the War on Poverty and the African American Freedom Struggle in Rocky Mount, North Carolina,” Journal of Urban History 34, no. 4 (2008): 639–664; Wesley G. Phelps, A People’s War on Poverty: Urban Politics and Grassroots Activists in Houston (Athens: University of Georgia Press, 2014). Also see the valuable collection Annelise Orleck and Lisa Gayle Hazirjian, The War on Poverty: A New Grassroots History, 1964–1980 (Athens: University of Georgia Press, 2011). 4. ↵ David Morath to “mom and dad,” 12 October 1970. The Morath letters will be deposited with the Auburn Avenue Research Library as part of the Emmaus House/Peoplestown Documentation Project. 5. ↵ Atlanta’s Fight against Substandard Housing: Is It Working? (Atlanta: Research Atlanta, 1972): ii-iii, 26; Robert D. Bullard, In Search of the New South: The Black Urban Experience in the 1970s and 1980s (Tuscaloosa: University of Alabama Press, 1989): ii-iii, 26. 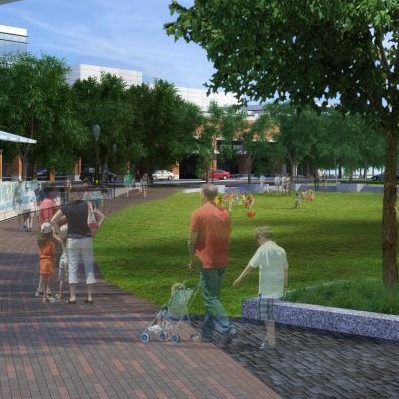 On urban renewal and other redevelopment projects’ impact on Atlanta, see Ronald H. Bayor, Race and the Shaping of Twentieth-Century Atlanta (Chapel Hill: University of North Carolina Press, 1996), chapter 3; Irene V. Holliman, “From Crackertown to Model City?,” Journal of Urban History 35, no. 3 (2009): 369-86; Larry Keating, Atlanta: Race, Class, and Urban Expansion (Philadelphia, PA: Temple University Press, 2001); Clarence Nelson Stone, Economic Growth and Neighborhood Discontent: System Bias in the Urban Renewal Program of Atlanta (Chapel Hill: University of North Carolina Press, 1976). 6. ↵ Tomiko Brown-Nagin, Courage to Dissent: Atlanta and the Long History of the Civil Rights Movement (New York: Oxford University Press, 2011), 266–72; Winston A. Grady-Willis, Challenging U.S. Apartheid: Atlanta and Black Struggles for Human Rights, 1960–1977 (Durham: Duke University Press, 2006), chapter 4; David Andrew Harmon, Beneath the Image of the Civil Rights Movement and Race Relations: Atlanta, Georgia, 1946–1981 (New York: Garland, 1996): 192–203; LeeAnn Lands, “Poor People’s Campaigns in the Deep South,” paper presented at the Association of American Geographers, New York, NY, February 2012; Kathryn L. Nasstrom, “‘This Joint Effort’: Women and Community Organizing in Vine City in the 1960s,” Atlanta History 48, no. 1 (2006): 28–44; Jason Micah Perkins, The Atlanta Vine City Project, SNCC, and Black Power, 1965–1967 (Columbus: Ohio State University, 2008) 29. 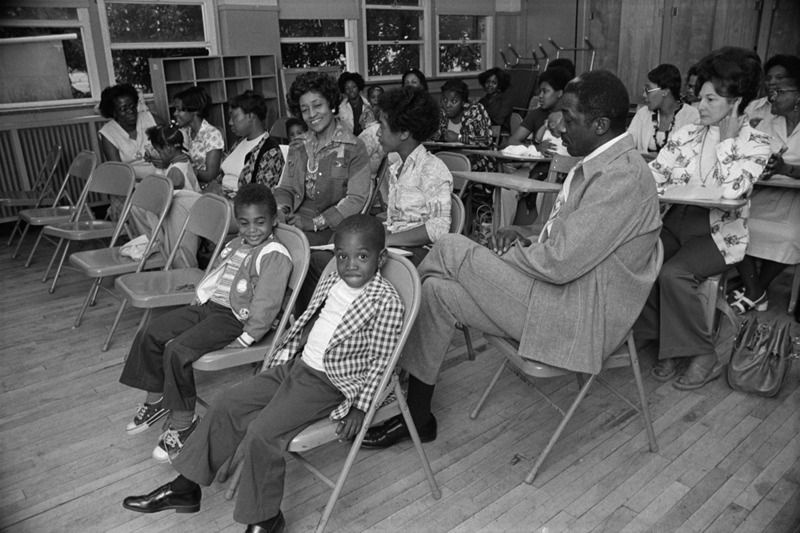 SNCC’s Atlanta Project also organized in Vine City, particularly in 1965 and 1966. 7. ↵ “The Lovett School Controversy,” http://www.episcopalarchives.org/Afro-Anglican_history/exhibit/escru/lovett_school.php; Lands interview with Austin Ford, available at http://thepeoplestownproject.com/2011/austin-ford/. 8. ↵ Lands interview with Ford. 9. 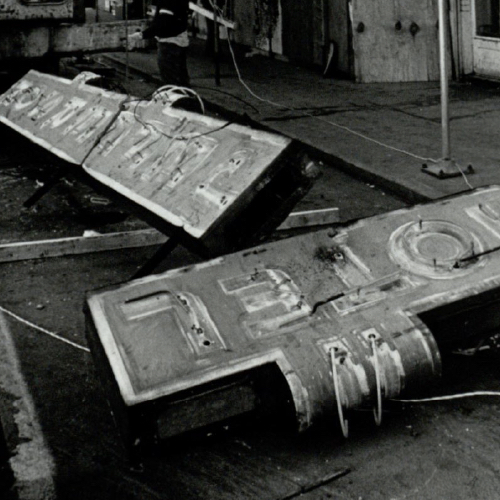 ↵ Holliman, “From Crackertown to Model City?,” 374, 81; Stone, Economic Growth and Neighborhood Discontent: System Bias in the Urban Renewal Program of Atlanta, 54. Lands interview with Mimi Bodell, available at http://thepeoplestownproject.com/2011/mimi-sister-marie-bodell-2/. 10. ↵ Lands interview with Gene Ferguson, in possession of author. 11. ↵ Lands interview with Bodell. 12. ↵ Lands interview with Bodell. Programs at Emmaus House in the late 1960s and 1970s are discussed in Lands interview with Ford; Lands interview with Bodell; Lands interview with Goldstein, available at http://thepeoplestownproject.com/2011/dennis-goldstein/; Lands interview with Quinnelly, available at http://thepeoplestownproject.com/2011/ray-quinnelly/; interview with David Morath, available at http://thepeoplestownproject.com/2011/david-morath/; Lands interview with Charlotte Norby, available at http://thepeoplestownproject.com/2011/charlotta-bright-norby/; Lands interview with Grace Stone, available at http://thepeoplestownproject.com/2011/grace-stone/; Lands interview with Tom and Debbie Shields Erdmanszyk, available at http://thepeoplestownproject.com/2011/emmaus-house-oral-history/; Lands interview with Sam Dimon, available at http://thepeoplestownproject.com/2011/sam-dimon/; Lands interview with Albert E. (Ned) Stone, Jr., available at http://thepeoplestownproject.com/2011/albert-e-ned-stone-jr/; Lands interview with Silva Griggs Britt, available at http://thepeoplestownproject.com/2011/silva-griggs-britt/. 13. ↵ Lands interview with Goldstein; Lands interview with Grace Stone. 14. ↵ Tools developed and utilized by Emmaus House and the PRO are explained in Lands interview with Goldstein; Lands interview with Stone. 15. ↵ “Make the Grievance Procedure Work For You,” Poor People’s Newspaper V (March 1975), folder 4, box 1, Lokey Papers. 16. ↵ “A New Georgia Eviction Law,” Poor People’s Newspaper (no date), folder 4, box 1, Lokey Papers; “More About Housing Rights,” Poor People’s Newspaper 1 (January 28, 1970), folder 4, box 1, Lokey Papers. 17. ↵ “The People Carry Out Successful Rent Strike,” Poor People’s Newspaper II (May 1972), folder 4, box 1, Lokey Papers; “Ms. Eva Belle Davis,” Poor People’s Newspaper II (June 1972), folder 4, box 1, Lokey Papers. 18. ↵ “Attention, Model Cities Residents!” Poor People’s Newspaper IV (October 1974), folder 4, box 1, Lokey Papers. 19. ↵ “Relocation Effort a Success,” Poor People’s Newspaper V (January 1975), folder 4, box 1, Lokey Papers. 20. 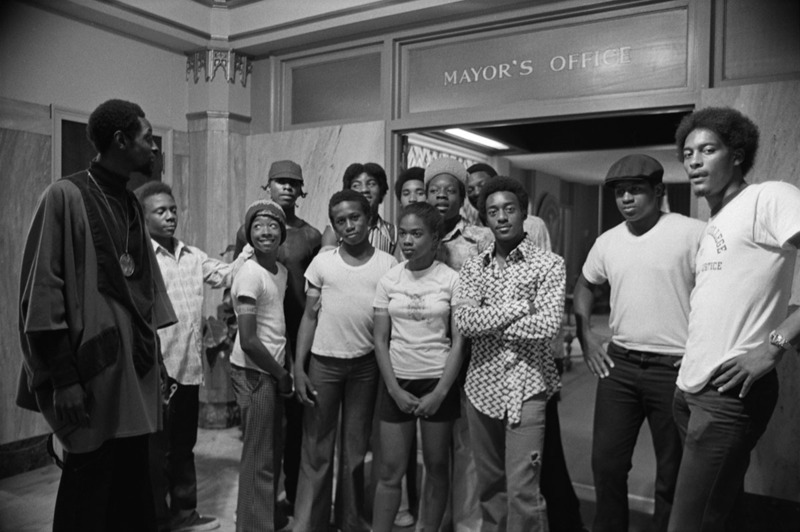 ↵ “Sugar Hill Group Wins Settlement Against AHA,” Poor People’s Newspaper IV (November 1974), folder 4, box 1, Lokey Papers; “Help Us find These People!” Poor People’s Newspaper V (January 1975), folder 4, box 1, Lokey Papers. 21. 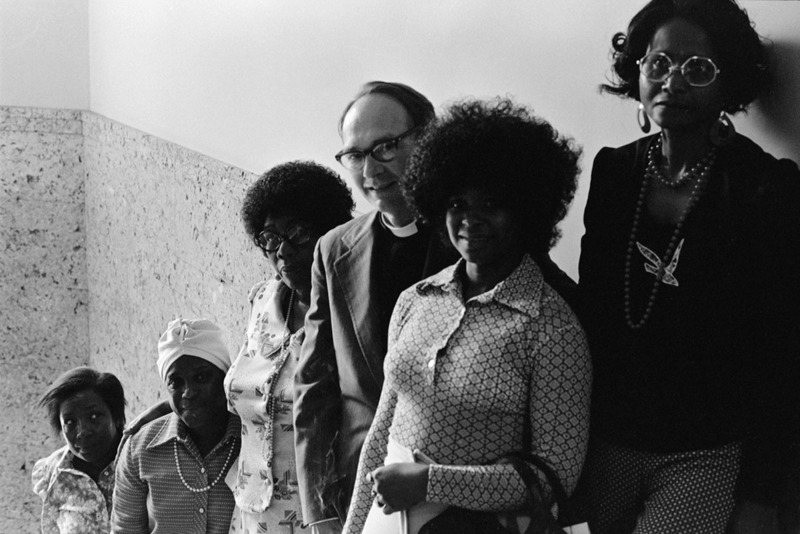 ↵ On Atlanta’s chapter of the National Welfare Rights Organization, see Daniel Horowitz, It Came From Somewhere and It Hasn’t Gone Away: Black Women’s Anti-Poverty Organizing in Atlanta, 1966–1996, M.A. thesis, Georgia State University, 2014, particularly p. 32–37. A number of recent scholarly works examine welfare rights organizing. A useful overview of this literature is contained in Premilla Nadasen, Rethinking the Welfare Rights Movement (New York: Routledge, 2012). 22. 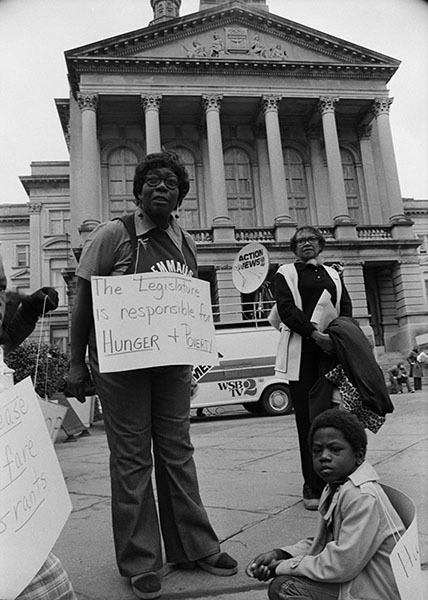 ↵ On the Georgia Poverty Rights Organization, see LeeAnn Lands, “Lobbying for the Poor in the 1970s Deep South,” paper presented at the Association of American Geographers, Tampa, FL, April 2014; Kathryn L. Nasstrom, Everybody’s Grandmother and Nobody’s Fool: Frances Freeborn Pauley and the Struggle for Social Justice (Ithaca: Cornell University Press, 2000), chapter 6.